Amgen’s CGRP drug provided significant relief to participants with chronic migraine, according to new study results presented at an international conference in mid-September. The drug, called erenumab, was tested at two doses, 70 mg and 140 mg. “Both doses of erenumab were associated with significant improvements in health-related quality of life, headache impact, disability, and level of pain interference, compared to placebo,” according to Amgen’s press release announcing the study’s results. Here’s a brief summary of the study’s details and it’s findings. All participants had chronic migraine. At the start of the study, they had an average of 18 migraine days per month and 21.1 headache days each month. The following outcomes were assessed during the last four weeks of the study. Reduction in migraine days per month: Those who were given erenumab (at either dose) had an average of 6.6 fewer migraine days a month. 50% or greater reduction in the number of migraine days per month: 40% of participants who received the drug at 70 mg and 41% who got 140 mg had their number of headache days decreased by at least half. Reduction in use of acute migraine drugs (abortives): Participants who received 70 mg of erenumab took abortives on 3.5 fewer days; those who received 140 mg reduced their medication use by 4.1 days. Reduction in headache hours: Participants who received 70 mg of erenumab had 64.8 fewer headache hours in the month; those who received 140 mg of erenumab had 74.5 fewer headache hours. 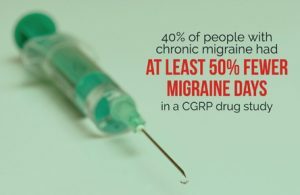 This yet is another promising report on the CGRP drugs that are in development for migraine prevention. 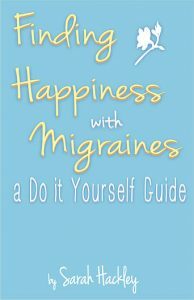 All studies so far have found a notable reduction in migraine frequency and improvement in health-related quality of life for a significant portion of participants. Minimal side effects have been reported thus far. This was a Phase 2 study. 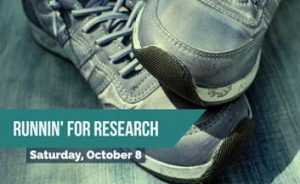 Phase 3 studies, which are underway now, will include more participants and give us more information on side effects. Turning 40 has been unexpectedly difficult for me. It’s not aging so much, but the recognition that I have spent the last 15 years in service to migraine. While I don’t normally worry about the future, somehow moving to a new decade has me projecting the past 15 years onto the next. I’ve written more about my churning thoughts, but they don’t feel worth sharing. I don’t want to spend more time thinking about grief and fear right now. 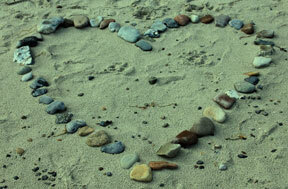 Because even though these days have been difficult, my heart is also swelling with gratitude. A friend was over last night and she, knowing how much I love my birthday, asked what my plans are. I explained that it’s been tough making plans because I can’t celebrate with food (which is how I used to celebrate everything), the weather is still too hot to do anything outside, and I’ve been getting migraine attacks every time I’m indoors in a public space. That led into a conversation about how scared I am that my life will always revolve around my health, how I panic whenever my migraine pattern (and responsiveness to treatment) changes, and how tired I am of exerting so much effort just to remain barely functional. As I cried, so did she. When I told her I just want to eat cake for my birthday, she told me she wants that for me, too. I’m always grateful for this friend, but the cake thing took it over the top. She knows how much food means to me and how momentous eating cake would be. It was a reminder that she always sees me for who I am and listens to what I have to say. She doesn’t have migraine, but she totally understands what I am going through. Having a friend like this feels like such a gift, but this is just one story of one friend. She’s not all that different from the rest of my friends. They understand that when I talk about migraine, I’m telling them about my life, not complaining. They listen with concern and love. They also get that sometimes I don’t want to talk (or think) about migraine at all. They aren’t put out when I have to reschedule or when I retreat from the world for months at a time. They see who I am underneath migraine and recognize how hard I try to get better. They love me. I’m turning 40 after a very difficult year with my health. I am sad about the past and fearful of the future. I am also amazed by the beauty and joy in my life. I have the support of so many amazing people. Even on the hardest days, I never doubt that I am loved. That’s what I am going to focus on today, not the loss and longing that has filled this year or fretful thoughts of a future I cannot predict. As I celebrate my birthday, I’m also celebrating the abundance of love in my life.